The Official Second single! Of the new, KRS-One 2015 album. Now Hear This! Coming out, November 24th. Hashtag #nowhearthis to spread the word! Every culture produces its own “keeper”. Every culture produces its own principles, its own history, its own advocates, and its own prophet pointing the way to that higher quality of life. For the urban-street culture known in the world today as “Hip Hop”, KRS-One is all of the above. His latest project, Now Hear This available November 24th 2015, was created while KRS-One was touring the U.S., the U.K. and Europe. “Everywhere I go, from big festival stages to intimate clubs and bars, people want that boom-bap” says KRS-One. “But still, even though the streets are crying-out for more depth and authenticity in Hip Hop, very few rappers today are willing to actually deliver”. “This album is raw”—this is one of the first things heard when you press play on NOW HEAR THIS, and raw it is! KRS-One puts on his headphones, checks on his lead producer DJ Predator Prime, and Boom! Song after song speaks with clarity, strength and substance! Much of the subject matter on NOW HEAR THIS deals with the current social challenges of our time and documents the often ignored views of America’s “other” citizens. KRS-One has always been ahead of his peers with beats and rhymes that have guided and developed Hip Hop itself, but with songs like “Drugs Won”, “American Flag”, “From the Beginning Again” and G Simone’s “Oh Cruel Mob” poem which concludes the album, KRS-One clearly leaps ahead of what is commonly called “hip-hop” today, and brings us right back to what original Hip Hop was always meant to be—THE UNAPOLOGETIC VOICE OF THE PEOPLE! Yes, we all like to party and get crazy at times; but not all of the time, and KRS-One’s NOW HEAR THIS project brilliantly balances salient social street issues with classic DJ and emcee party-rocking rhymes. Songs like “Duty”, “Let’s Go” and this week’s release “Sound Man” are sure to move the neck of any true Hip Hop head. 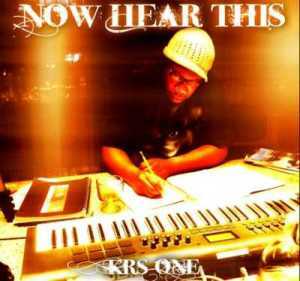 KRS-One dedicates a track to the sound men out there. “Now Hear This!” drops November 24th.